I don’t wish to start moaning already, but… it’s a bit too hot. It’s only March and it’s 31 degrees. We moved from Worthing because it was too cold to cycle (yes, we’re pathetic) and now we’re thinking that it might be too hot to cycle. It’s beginning to sound like we’re looking for reasons not to cycle. The whole experience so far has been utterly overwhelming. It’s just so perfect and beautiful; a proper country idyll. There’ll be bad days and worse days, I’m sure, but right now it’s like a very long held dream come true; something I wasn’t sure would ever come to fruition throughout the decades (yup, that long) that this lifestyle has been on the cards (spreadsheet). I won’t get too smooshy here, but this is all a pretty big deal. If you’re reading this and thinking you’d like to live differently, but are scared to take the step: take the step. Mostly this is all wonderful because we have a lemon tree. 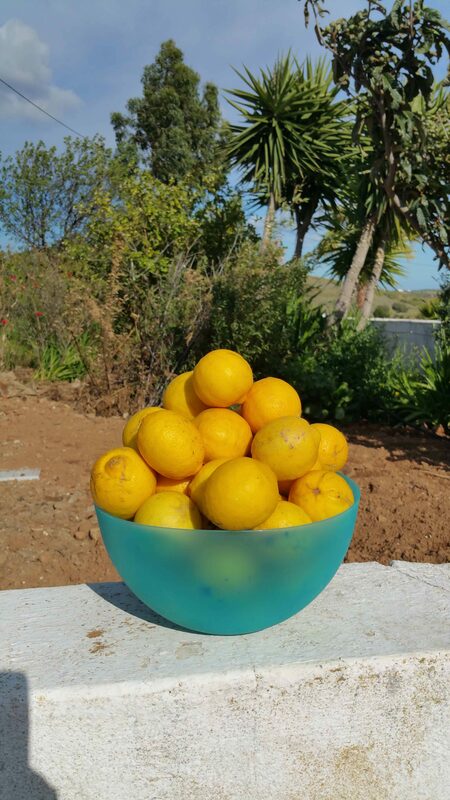 The Algarve gets two crops of lemons a year because the climate is so warm for so long. These particular lemons are from the autumn batch last year and most were gathered from the ground, so are a bit old, but perfectly fine. The lemon tree is the paler green bush in the background, currently covered in blossom and green lemons. Hundreds of them, which will all be ready in the next few weeks. Lemon Armageddon. Lemageddon. Armalemon. So, in the spirit of economy, good living and the utter joy of foraged food, we have eaten a lot of lemons in our first week here so as not to waste them. That is alongside three 200 miles round trip journeys to IKEA. That’s right, three visits to IKEA in one week. What fresh hell is this? 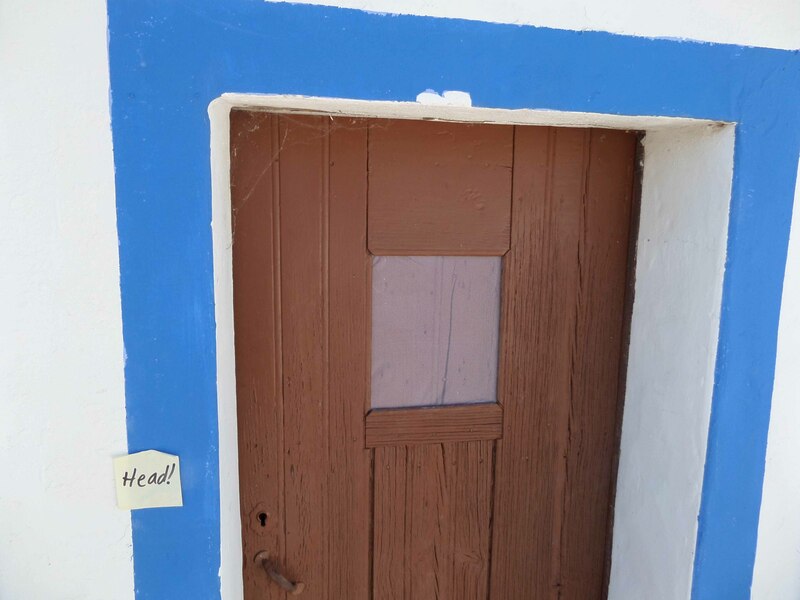 In our defence, our doorways are both low and narrow and nothing but flatpack furniture will fit through them. We are in zero fear of burglars who will not be able to get anything out without first dismantling it, and no one in the history of the world thinks that would be worth a day of their life. So, on the menu this week has been Lemon Chicken, lots of sparkling water drunk with, you guessed it, freshly squeezed lemon juice. 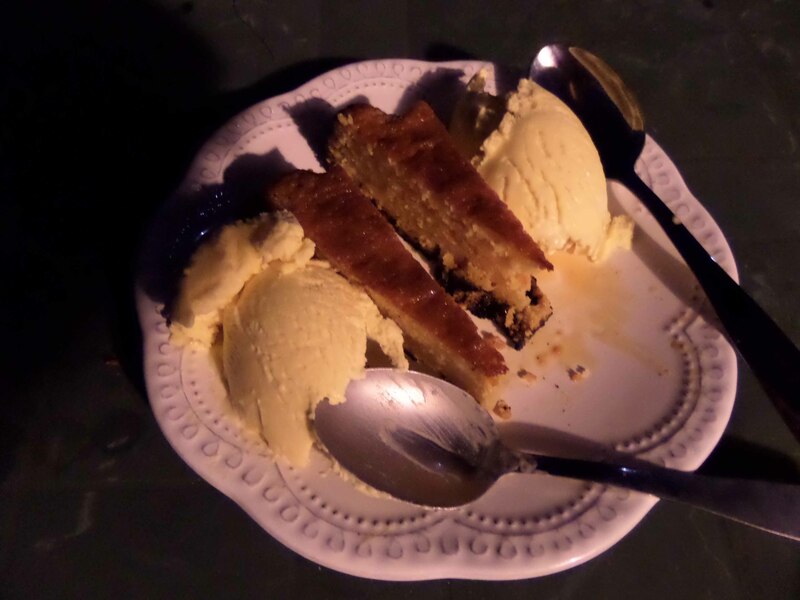 I’ve also baked a Spanish Almond Torta, which is traditionally made using oranges; not this time.Served with Lemon Curd Ice Cream made from the Lemon Curd that I made with my… er… lemons. Lemon Curd Ice Cream is as good as it sounds and just requires Lemon Curd and whipped double cream chucked in the freezer, if you don’t have an ice cream maker. As I still had around 30 odd lemons after all that lot of culinary creativity, my brother, Frank, reminded me about Preserved Lemons, which are a staple of Moroccan cuisine and have a very different lemony taste; the bitterness goes. They are pretty pricey in the UK and, as it turns out, pretty easy to make. I now have to wait four weeks before I can eat them, by which time there will be another 300 lemons ready for consumption. Ah well, no such thing as too much lemon cake. 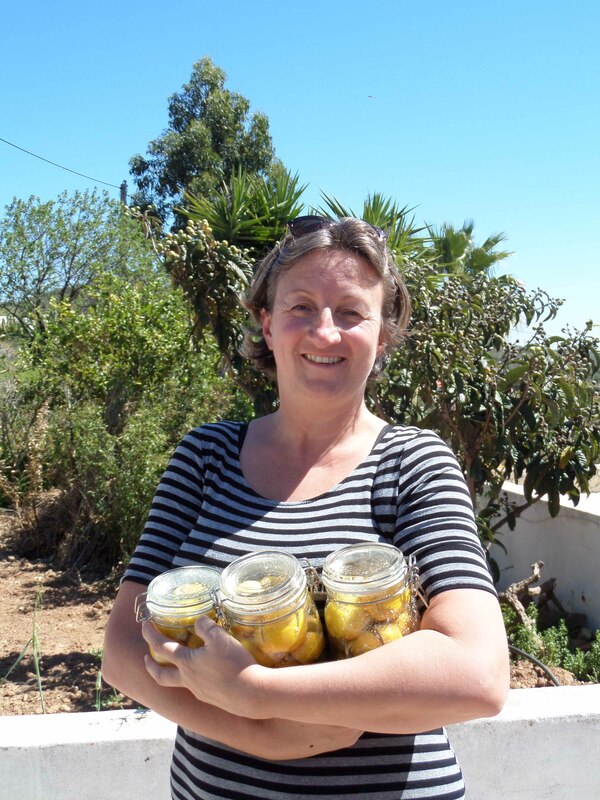 Here I am, looking proud with my jars of (free) Preserved Lemons. 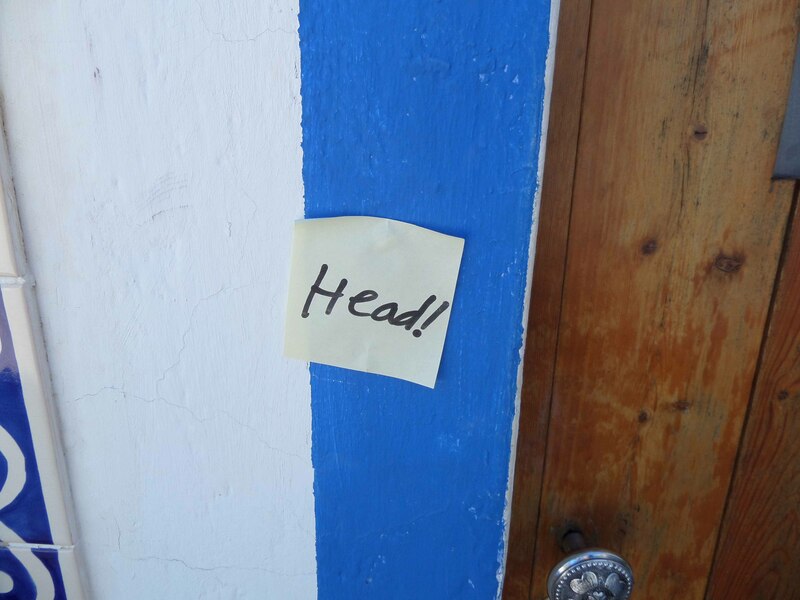 A Post-It note Blu-taced next to every single doorway in the house. I somehow knew whilst I was packing for this trip that taking Post-It notes, marker pens and Blu-tac would be a good idea. Never leave home without stationery, I say. But it’s not all rural bliss in the country, I appear to be allergic to Portugal, or sun, or something. Since being here I’ve developed a lumpy rash all over my body, mouth ulcers, cold sore, streaming eyes and incessant sneezing. I’ve never suffered from hayfever or allergies of this nature, but it has been a while since I’ve been in the midst of quite so much nature. I’ve started eating a spoon of local flower honey every day to try and desensitize to the pollen and it seems to be working. 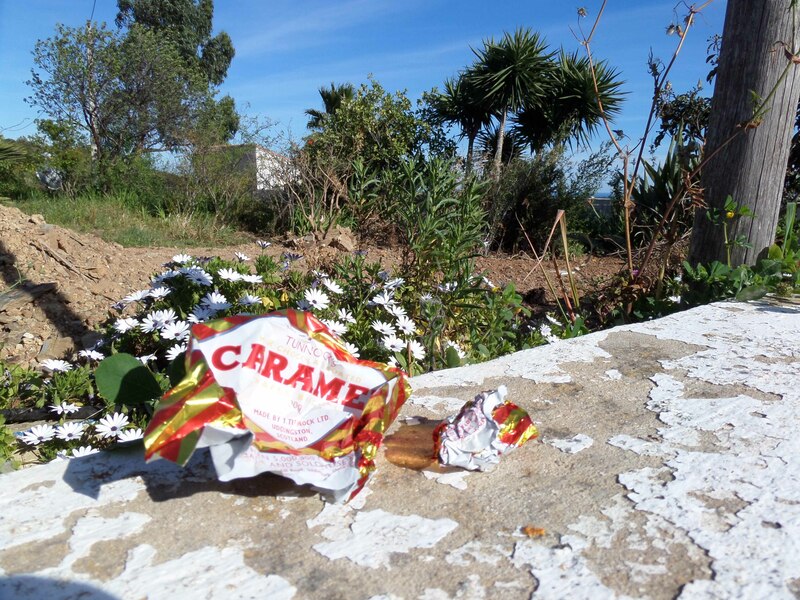 A much greater risk to our new life is that we’ve also nearly run out of Tunnocks. Strangely enough, I’m not expecting much support or sympathy in our time of need here, guys. Guys? 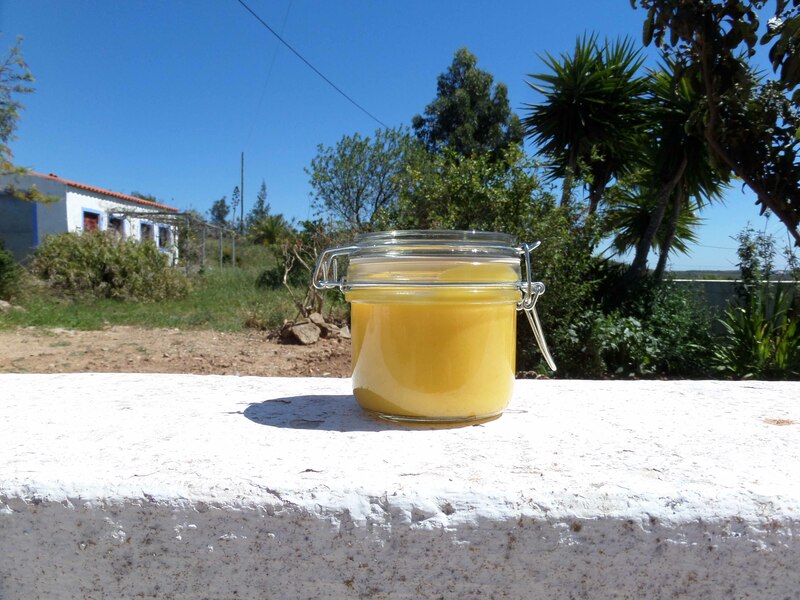 This entry was posted in Food, Living in Rural Portugal and tagged Algarve, Lemon Cake, Lemon Curd, Lemon Torta, lemons, Portugal, preserved lemons, Tavira, Tunnocks. Bookmark the permalink. Loving your Letters from the Algarve a la Alistair Cooke. Looking forward to the time we can chase Theo around the lemon tree. Hmmmm, seen that rash before. You’re allergic to lemons. It always mystified me why people around those parts plant lemon or orange trees and leave all the fruit to rot. But they’re all at it. Maybe your single-minded determination to use every fruit will serve as an example to them all. Rather than a lemageddon, this could be a turning point in the fortunes of the humble citrus; a lemaissance. Alternatively, have you thought of asking the previous owner how they dealt with it? It’s true – same in Greece. Fact is they seem to grow so readily and are worth very little to sell, given the time/cost of harvesting them, unless you’re a commercial producer – 5kg for €2 here at the moment – that I supposed there are only so many oranges/lemons a person can eat. I think its only the newcomers who are overwhelmed with excitement at having a citrus tree in their garden; the previous owner just ate what he wanted and left the rest – totally blase about the things. I have the advantage of being extremely obsessed with wastage, free food and am more than happy to eat the same thing for months on end. We’ve bought a lime and orange tree to keep the lemons company – we already have a grapefruit. For the last 6 months we have started each morning with a pint of warm water and the juice of 1 lemon. We both feel definite benefits of this and find we aren’t drinking so much coffee either. This could help you use up another dozen a week. My Mum used to do that! I’ve preserved so many (Moroccan style) that we’ve run out! I’m now sitting next to the tree willing the next batch to hurry up and ripen.